It doesn’t have a wall, yet, but that’s just details. Considering how many doors we’ve removed in this house, you’d think adding one back wouldn’t exactly make me jump for joy, but this one’s different. This one, the pocket door we bought last week, is replacing one of the largest eyesores in the house, one we see every day when we walk in the back door. When I said that I thought we’d done most of the demo last weekend? Yeah, so not the case. We’d done the impressive part, but the fiddly bits of getting the small sections of the hallway that will become the bathroom took almost as much time and effort to remove as the entire interior wall structure! So, yeah, the devil’s in the details and all that. 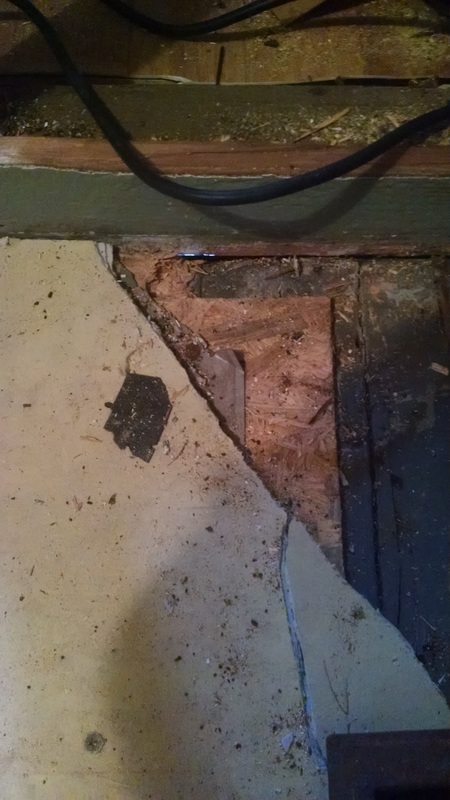 That would be, starting from the upper right corner, the original porch flooring, the old pressboard and vinyl tile that were to be removed during the renovation, and the new concrete board the contractor placed on top of all that mess. Not pictured is the new vinyl flooring they put in (it’s folded back). Seriously, folks. What the ever-lovin’ hell was that contractor thinking?! Yes, I told him I would be replacing the floor **covering** in the next two years (so I didn’t want to pay a lot for the material we’d be ripping out) but I didn’t realize that translated to half-assing the whole thing?! No wonder the back door wouldn’t open after they installed the new floor! So aggravating. It was (and is) irritating, but it’s not the end of the world. Todd was planning to replace the sub-floor anyway, apparently (I thought we’d only have to patch where plumbing had been, though hindsight shows a full new floor is the better route even then). We also had to have a conversation about just how far to build the floor up, then–to be level at it’s current height or to build it up to meet the level of the dining room. The hall is the part in play, since it’s something like 20Â° off from one side to the other, and I don’t mind a slight step down between the hall and bathroom, but Todd ultimately decided that he’d rather do two layers of plywood subfloor for added strength as well as to bring it up to approximately the right level, and go from there. It’s a small room, the extra materials aren’t going to kill the budget, and it’s probably the best solution in the long run. 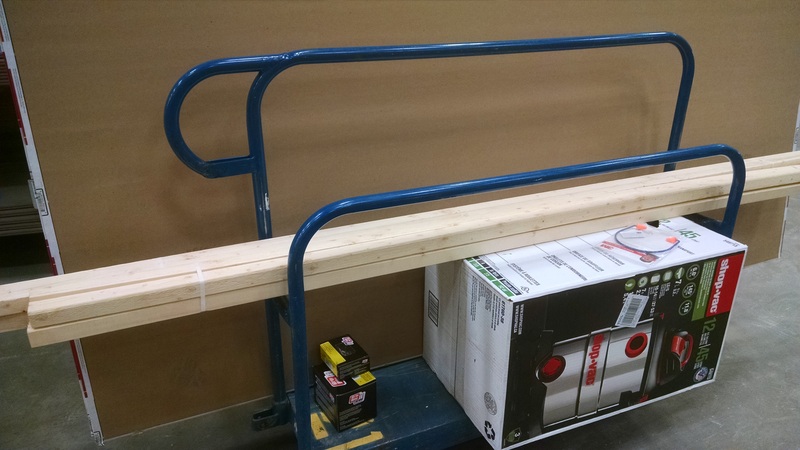 But before we could get the joist in we needed to make a Lowe’s run for longer nails. We were able to borrow a truck from Todd’s office and picked up the dryall for the new wall and plywood for the floor (which are both chilling on the front porch for now) along with the nails, ear protection for me, the 2x2s to (I believe) reset the hall ceiling, etc. that we had to cut into and a shop-vac. We’re now closing in on $700 of the budget spent, including the tools, so that’s not too bad. Now, I hate vacuums with a passion, but I wanted the shop-vac because sweeping was just not cutting it for the debris we were creating and my ancient vacuum would not have been able to hack it. Not that I’ve actually used Robbie the ShopVac yet (it reminds me of Robbie the Robot and I like to name things; like the puppies on the Puppy Cam on Animal Planet Live we kept checking in on between tasks last weekend; they were ardorable), but Todd has and it definitely does its job. Just like the reciprocating saw, that thing has been put through its paces and is making life so much easier! Saturday evening felt a lot like when we first bought the house: construction debris in the back hall, a trip to Lowes, and a swing through a drive-thru because we’d skipped lunch. Unlike those early days, though, we couldn’t pack up and head back to a separate house in another state when we were through, but that’s not such a bad thing. Sunday’s big job was installing the new wall framing. It looks deceptively simple, folks. And I know the saying goes “measure twice, cut once” but it’s really somewhere along the lines of measure half a dozen times, cut it, try to install it and find that it’s still just a hair off, and while we’re at it let’s review the way we were going to install this framing in general. But my incessant question-asking actually helped because we figured out a better way to deal with the studs and the brace along the top and all was well. Unlike last week we (and by we, I mean Todd) actually made some evening progress during the week. We had to re-position the pocket door studs (which necessitated trip #3 to Lowe’s–it’s officially a project by Todd’s standards, now–for more screws) after placing them at the wrong intervals the first time and then we could finally remove the rest of the wall framing from the old bathroom wall. 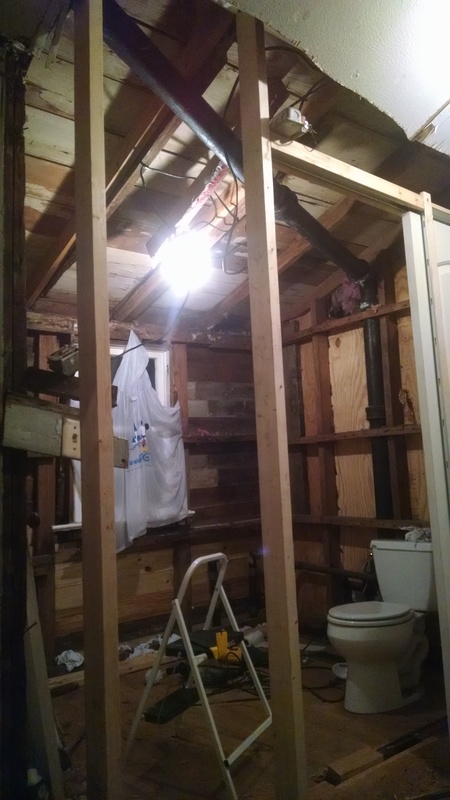 Last night Todd got in there, even though he got home 2 hours later than he’d planned, and ripped out the old ceiling beams and, folks, we’re talking major transformation here. The old ceiling met the wall just above the window (below the 2×4) and extended straight across. We’re regaining only about 4″ on the window wall but on the door wall we’re talking several feet. This room will no longer feel like a hovel and it’ll actually fit in with the rest of the house! It’s a small thing, folks, but this feels super big to us. Because that last bit was going on right up to 10 o’clock last night, the video won’t be posted to our YouTube channel until this weekend so I can include the full week’s progress. Make sure you subscribe so you don’t miss it! This week coming up we’ll tackle the floor, place the drywall for the hall-side of the new wall, and work on electrical and plumbing. I hope. That’s the plan, at any rate! WOW! That looks like a lot of work. We are going to be starting a new project soon and i am dreading all the dust. We are looking at switching out the current door for a Pocket door as they are such a space saver..can’t wait to install one in our bathroom downstairs. It’s definitely going to save us space in the end. The actual door installation was very simple, good luck to you with yours! For such a small room there are a number of “moving parts,” that’s for sure! We’re certainly hoping so. After this week some of the room’s true potential is easier to see! So impressive, this looks like a lot of tough work!! We revamped our house my family currently lives in, but I was little so I don’t remember any of it…I can’t imagine doing all of it. Keep it up! Looks great and it’ll be soooo worth it! So far it’s been messy and tiring–and just when I think we’ve finished tearing things out we find more than needs to go. But it’ll definitely be worth it in the end! Such a great way to document house projects in style ! Wonderful ! Thank you, Koninika! I learn so much reading other people’s project posts I can only hope my posts will do the same for someone else. You are brave for taking on a project this big! I am wimpy, so I just watch HGTV and pretend I’ll fix up my house someday! Having a very handy husband helps with the bravery–I’m not sure I’d tackle so much on my own (though I did use the reciprocating saw today and that was kind of awesome!). I think the saying go “Well begun is half done,” from Mary Poppins, right? I feel like we’re finally making some forward progress this week and being able to see the changes instead of just knowing stuff got done really helps keep the momentum going! I’m always so impressed with anyone willing to take on a project like that themselves. I’m handy, but don’t know if I could do this. Can’t wait to see the finished project. Each new thing that comes up I’ve been pushing myself to try–be it using a new tool or whatever–and I’m finding that I can do a lot I might not have otherwise expected. Would I want to do this fulltime? Probably not, but it’s not nearly as hard as it seems once you just get in there and start! Yes, it’s definitely worth it. Hopefully we still think so when it’s time to start the next room! Oooh, that sounds like a step in a good direction–more space is always a plus in my book! Best of luck with your project as well! My husband replaced our exterior door right before the snow started around here, the door is on, it is weather tight, but we also have to replace flooring…that will be in the spring. Congrats on your door! Thanks, Heather! Congrats on the new door. All three of our exterior doors need replacing, too–thankfully we don’t have to worry about snow! Wow, congrats on the new door. I can’t wait to see it when it’s done. Me too! It feels really good to see something going up instead of more coming down! I love LOVE pocket doors! This one looks so amazing in your space. I can’t wait for it to me done! Aren’t they awesome, Debra?! We’ve got 7 weeks until our first deadline, I hope we can make it! Yay for the door! I know how it feels to see a project coming togetherâ€¦but whoaâ€¦what was the contractor thinking? You really have to stay on top of themâ€¦if you give them a moment to slackâ€¦they will. My Mom found out the hard way when she saw a few quick fixes and blunders that the contractors did when they rebuilt part of her house. That’s exactly what we’ve learned, too, Yona, and it’s a shame people don’t take pride in their work. I think I’d consider some hidden cameras if I had to have a contractor come in unsupervised again. Instead, we’ll just do as much as we can ourselves! I am so happy I found your blog! I grew up in a small town in Texas with a ton of gingerbreads. LOVE them! I never thought I’d own one but here we are! 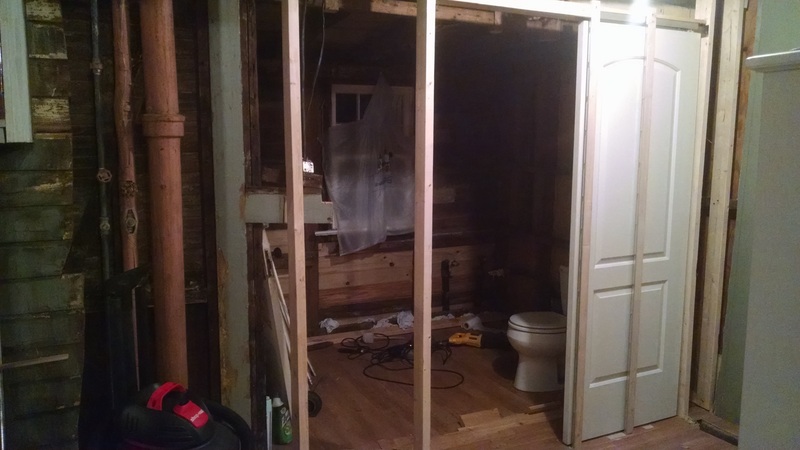 I hope you enjoy watching our remodel unfold! A Week of Meals + a Three Cheese Artichoke Dip Bonus!